Shane Claiborne’s Red Letter Revival in Lynchburg, Virginia, was a success. Not only did it gather 300 people celebrating Jesus and justice, but it also caught a lot of media attention thanks to Jerry Falwell Jr’s Liberty University. Shane had asked Falwell Jr., who is a passionate Trump supporter, if he could come and pray at the University. 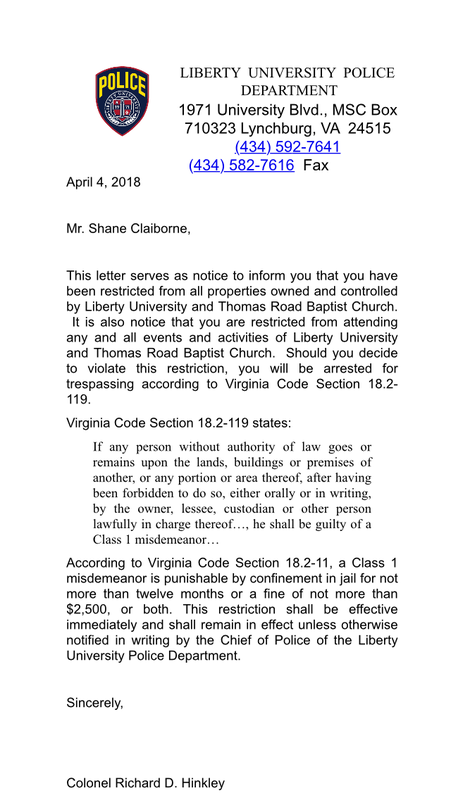 Rather than receiving a respectful “no”, he was sent a letter from the Liberty University Police Department telling him that he would be put in jail and/or fined 2,500 dollars if he just showed up at the University grounds. The threat was similar to the one Pentecostal speaker and author Jonathan Martin received in November when he tried to organize a prayer there. It’s ironic, to say the least, that a Christian University will arrest and prosecute those who pray – I’m telling you, pray – at their campus. It’s also ironic that Falwell Jr. killed the campus newspaper story about the Claiborne incident while claiming that free speech is a core value of his school. If you haven’t already, you should check out the comments Claiborne made on Trump and American idolatry in an interview with us. In this post, I want to share some of the other things he said in that interview regarding miracles, revival, and Bethel Church pastor Bill Johnson. I asked him if he thinks that it’s possible that God can help us in our social justice campaigning by doing miracles? – Absolutely! No doubt in my mind. I still have a deep charismatic and Pentecostal DNA in me, you know. One of the things I love is when these worlds come together. I think of prayer and action kind of like blades of scissors. They have to go together, they don’t work very well when they’re separated. If you have people who pray all the time or people who are activists all the time, we need to really integrate those. – I absolutely love Pentecostals & Charismatics for Peace & Justice. You look at folks that were part of the great revivals and they also talked about social justice. It changed the way they talked about possessions. I was raised Methodist, and even though some of the Methodist church has lost some of that fire, it was originally a very charismatic movement. John Wesley said, ”If I find money in my hands I get rid of it as quick as I can before it corrupts my heart.” He was a very wild social justice guy. – I’m a huge believer in miracles. I often refer to the fish and loaves miracle that Jesus does as a conspiracy between us and God working together. I think it was both a miracle and the attentiveness of the disciples, to notice that people were hungry. I think one of the beautiful things is that God refuses to change the world without us. He wants us to be a part of this. – Often those miracles happen when we put ourselves in a place where we need them. We live so much of our lives where we don’t really need much miraculous provision. We go to the doctor when we’re sick, we go to the store when we’re hungry. We aren’t living in a manner that requires miracles. – There are some amazing miracles that happen. Just the other day we were talking about Iraq – I was with a group of people that I was in Iraq with on two different times. We saw some stunning miraculous things, I would say. And there are still those stories coming out from Iraq, I heard one of them this week. Shane Claiborne simply is a charismactivist with a passion for miraculous social justice. It will be exciting to see if his faith even can move the mountains at Liberty University. Micael Grenholm is editor-in-chief for PCPJ.